Stuck in the swamp with no way home, future-Raph, Raph and future-Don continue their search for Armaggon and Leo. Along the way, though, they are greeted by a tribe of tiny, fluttering fairies. Back at the Shredder’s HQ, the villains are putting up a strong fight while Don works to repair the time-slip generator. The scales tip in the favor of the bad guys as hundreds of rats begin spilling in through the cracks, attacking the Turtles. In the swamp, the leader of the fairies, Dysnaea, welcomes the Turtles to the land of Thanatia. She offers to help them find “the land-shark”, but he finds them first, blasting them with another one of his shoulder-missiles. At the lair of the villains, Mike, Splinter and Ninjara are surrounded by the ravenous vermin. The Shredder and Verminator-X then reintroduce them to Ha’ntaan, the Rat King, who wants vengeance for his defeat at the hands of future-Don. Regular-Don, however, has kept hidden from the fray and sneaks off to look for help. Mike asks the Rat King how he controls his rodents and the Rat King explains that he uses telepathy. Mike swiftly karate chops the Rat King in the throat, rendering him unconscious and breaking his hold on the rats. This gives Ninjara and Splinter the opening they need to tackle the Shredder and Verminator-X. Ninjara and Splinter successfully render their foes momentarily unconscious. That is until the Rat King awakens and takes mental control of Splinter. Splinter begins pummeling Mike, intent on killing him. Don finally returns and subdues Splinter while his back-up, the freed future-Mike and future-Leo, see to the bad guys. 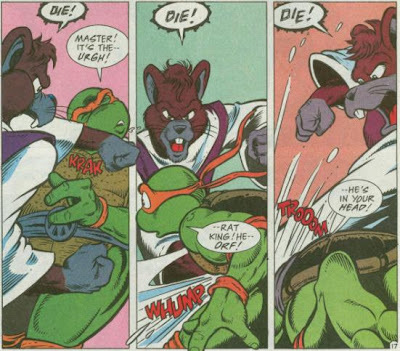 As Shredder and Verminator regain their faculties, they proceed to keep the Turtles at a stalemate. That is until the freed Merdude shows up and goads Verminator into firing a laser blast at him. Merdude dodges the bolt, which strikes the wall behind him, causing a flood of water from outside to come rushing in. With his rats flushed away, the Rat King retreats. Verminator-X and the Shredder quickly follow suit. In Thanatia, the Turtles have their hands full with Armaggon. They beat him back to the edge of a waterfall and it is the younger Raph who succeeds in pushing him to his apparent demise. The idea of killing doesn’t sit well with Raph, but he puts the matter aside as future-Raph and future-Don return with the groggy Leo. Just then, a time-slip opens and the Turtles escape from Thanatia through it. Later, on the roof of Turtleco, future-Don succeeds in sending Merdude home with his time-slip generator. As the Turtles all bid their goodbyes, future-Raph pulls Ninjara aside and tells her that they will have a falling out sometime in her near future and they will never, ever see each other again. He asks that when the moment comes, that she stick by her Raph. With the last goodbyes said, the Turtles return to their time. It begins to rain and the rather gloomy future-Turtles decide to go inside, unaware that the figure of Verminator-X watches them from a distance. Back in Thanatia, Armaggon sits in grumpy defeat next to the ruins of the Turtleco building, now trapped in the extremely distant future. The fairies giggle at his predicament as he curses to himself. *This story is continued from TMNT Adventures #43. The story continues in TMNT Adventures #45. *Armaggon and Merdude will return in TMNT Presents: Merdude and Michaelangelo #1. Verminator-X will return in TMNT Adventures #62. *The Turtles aren't through with the Eyes of Sarnath just yet, as Sarnath-himself will appear in TMNT Adventures #46. *The break-up between Raph and Ninjara that future-Raph alludes to will happen in TMNT Adventures #70. *Future-Don and future-Raph will return in TMNT Adventures #49, in the "Megadeath" back-up serial. *Shredder was originally planned to return in TMNT Adventures #71. However, as "The Forever War" storyline wound-up being cancelled, he won't make his comeback until Year of the Turtle #1. 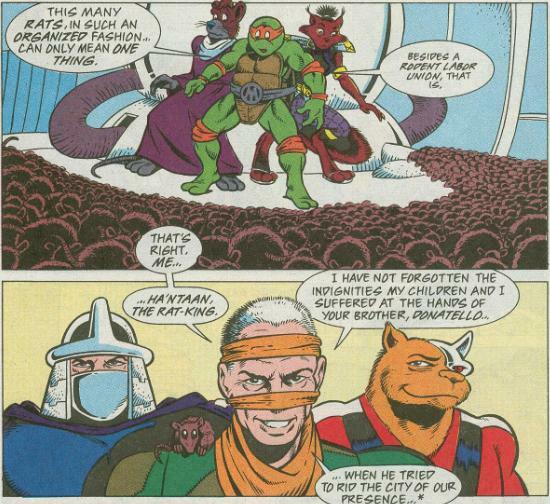 *Likewise, the Rat King was to return in TMNT Adventures #74, but the cancellation of "The Forever War" kept him from ever making a comeback. *This issue was published in the UK by Fleetway as TMHT Adventures (#80). And the beloved “Future Shark Trilogy” comes to a close. In three issues, a whole new world of storytelling has just opened up for TMNT Adventures and the title would only continue to gain more and more steam until its eventual editorial detonation. Of the three chapters, it’s this last one that’s my favorite. The preceding installments were strong, but they both suffered from a lot of exposition and narrative set-up that make them feel like little more than a prelude to this lone issue. The build-up certainly pays off, though, as this final chapter is loaded with action and the return of one of my all-time favorite (and under-utilized) characters: The Rat King. It’s a pleasure to see the Rat King’s thread, introduced briefly so many years ago, finally pay off when by all means it seemed like it was simply going to peter off into oblivion after the book changed gears away from shilling for Playmates action figures. 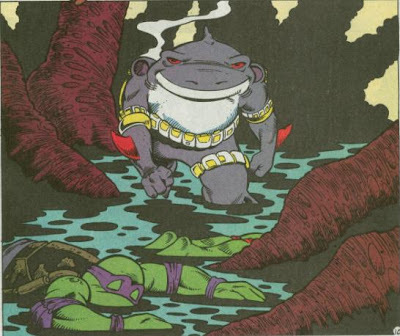 Though he’s hardly in the series, TMNT Adventures boasts one of my favorite interpretations of the character, who is wildly different in just about every universe he appears in. In the Mirage comics, he had no actual control over rats but was simply a lunatic living in an abandoned building who fell off a roof and died (later haunting Splinter as a disembodied spirit). In the 4Kids cartoon he once again had no control over rats, but instead was a malfunctioning cyborg clone of Agent Bishop called the Stalker who devolved into absolute insanity, though retained his godly fighting prowess. The Fred Wolf cartoon’s interpretation is probably closest to Archie’s, maintaining his “neutral” status for his first few appearances, but making his control over rats come from a silly flute song. Like so many things in TMNT Adventures, this Rat King is basically “the Fred Wolf version done right”. He starts out as a neutral figure, only becoming a threat once the Turtles “trespass” on him. And no stupid flute. The issue switches back and forth between an extended brawl with Armaggon and a free for all with the Shredder, Verminator-X and the aforementioned Rat King. 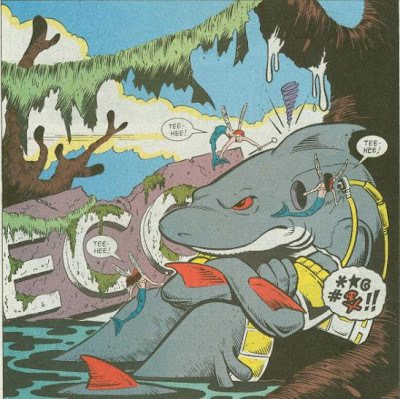 Since he’s in the title of this three-part story arc, Armaggon is depicted as the most skilled and deadly villain, which kind of comes at the expense of the Shredder’s dignity, as he’s dispatched by Ninjara with relative ease. Of course, this is the less-experienced, “goofy” Shredder plucked from early in the series, so that might explain why he’s less of a threat. The resolution is a bit abrupt and, well let’s be honest, there was really no reason for Merdude to be involved in this arc at all; any other character could have goaded Verminator-X into blasting the wall. But the action in this issue is still top notch and once again Chris Allan just knocks the whole thing out of the park. If there’s one other element I want to comment on, it’s the gamut of emotions the conclusion of this story runs. We start out at heartwarming and hopeful, as the future-Turtles bid their goodbyes to their past selves, Splinter and Ninjara. As soon as they leave, though, the Turtles suddenly become pensive and gloomy as the sky opens up and Verminator-X ominously spies on them from a distance. And finally, the issue ends on a pleasant comedy beat as Armaggon gets his just deserts. The storytelling transitions through these different emotions very fluidly and I much prefer the different levels of satisfaction presented here than a typical hamfisted “We did it, guys! Cowabunga!” hi-five ending. Are the guys doing the cover art even talking to the guys on the interior? The covers make Armaggon look like the terrifying offspring of Jaws and TinFins, and on the interiors, he's downright adorable. "Grade: A (as in, “Alright, I gave this one an A. Are ya happy, now?”)"
I have mixed feelings on IDW's Mirage hardcovers. As someone who's never actually read the material, I really want to take a look at it. But, I don't know if I can justify the price tag for material I've never read. It's a Catch-22 that I've oddly not encountered before in my comic collecting career. And I really loved that Peter Laird cover. It made me feel like something bad might really happen to Leonardo and the other turtles! I remember reading the first issue of this trilogy back when it first came out; my dad only bought me issues of TMNTA infrequently, and I had no idea the Mirage turtles existed,so seeing the sudden leap from its early, more cartoony style to this was a shock. I had no clue what was going on, and found the idea of the turtles not wearing the bandannas in the "proper" way to be just wrong. While the issue left an impression, it wasn't until more than ten years later that I managed to read parts two and three of this story. Like you've said, Mark, this is definitively a story that is more important because of what it means for the book than because of what actually occurs in it. 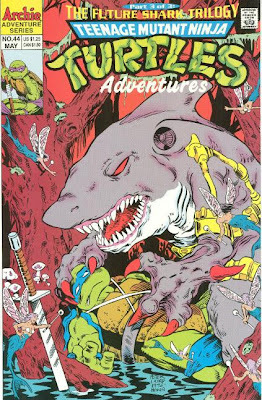 After the pretty ace first issue, there's nothing in the other two that isn't done better in "Dreamland"*--sure, that latter arc may not have the Shredder, Armaggon, or the Rat King, but as a whole it deals with the setting, the characters, and the tone much better than Future Shark parts 2 and 3 did. Is the arc bad? No--taken as a whole, it's a solid B. Anything more than that, however is overrating things a bit, I feel. *Which I did read in its entirety back when it was first released, so I'll admit that nostalgia plays a role in my preferences. never read this as a kid and just read it now as an adult. it was great, have to put it up there with the other series highlights so far up to this point. the more serious tone was handled very well. the future turtles being touched to see a splinter they missed, raph imparting advice to his younger self to a relationship he obviously regrets screwing up and some introspection about the turtles living longer than everyone else just added layers to the characters that weren't there before. the designs were awesome, of the future turtles and the new bad guys. all classics. and it was good to see some bad guys that posed an actual threat, i mean we have seen actual evil characters but this was a level beyond as the battle the turtles lost actually had a lasting effect on the turtles for the first time ever. a little sad that shredder wont be seen from again and allen doesn't draw a very good rat king but thats just nitpicking. if i read this as a kid i would of been hyped into space i'm sure.